I got my first issue of Allrecipes and did I ever have fun. Is there anyone else who subscribed to the new magazine. There is a section, this month on savory pies and I wanted to make all five of them. In the end, I combined two and made a third with a different vegetable. Their choices are Broccoli Cheese Pie, Tangy Tomato Tart, Sweet Onion Pie, Asparagus Pie and Granny's Italian Zucchini Pie. Some of the crusts were not traditional which was great for me. I am always looking for alternatives to avoid flour and crusts with lots of fat. My first masterpiece was a combination of the Broccoli and Tomato. 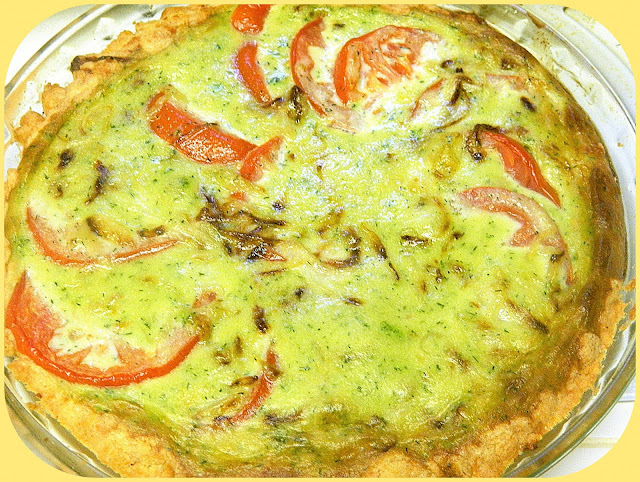 I used the crust from the broccoli which had cheese in it with tomato for the vegetable. In a bowl, mix the Cheddar cheese, 3/4 cup GF flour, 1/2 teaspoon salt, and mustard. Mix in 1/4 cup butter until evenly moist. Press into the bottom and sides of an 8 inch pie dish. Heat the 1 tablespoon oil in a skillet over medium heat, and saute the onion and mushrooms until tender. Stir in 2 tablespoons flour, half and half, dill dip, 1 teaspoon salt, and nutmeg. Bring to a boil, and cook 1 minute. Remove from heat. Gradually stir in eggs. Place tomato slices in pie crust and cover with above mixture. Bake 15 minutes in the preheated oven. Reduce heat to 375 degrees F (190 degrees C), and continue baking 20 minutes, until a knife inserted in the center comes out clean. Eat and enjoy. I think it was the addition of the dill tip that made this spectacular. You could use any dip that you think would work and I am taking bets on how delicious, it will be. LOL! I'm glad I'm not the only one who uses the wrong size measuring cp! I'm looking for a set that has a different color for each size measurement. When a recipe calls for 1cup and I use 3/4 cup the result isn't quite the same. Cheese crust sounds perfect! I love tomato pie, but have never used dill in it. Thank you for linking, Chaya!